Considered by many in the profession as the consulting bible, Flawless Consulting explains how to deal effectively with clients, peers and others. 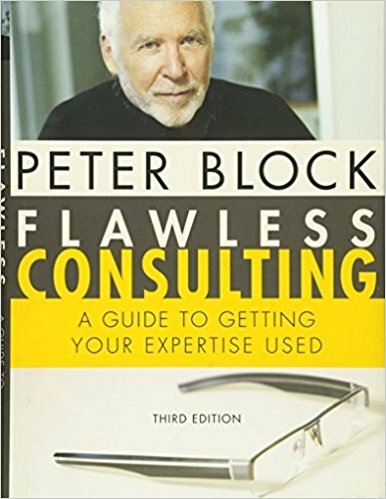 For its author, Peter Block, the key to being a successful consultant is to understand that clients don't resist change, they resist coercision. "The real work of consulting is to shift people's narrative from 'what's wrong with us' to 'what's possible for us'?" This new edition covers the consulting challenges that have arisen from the way we routinely communicate electronically and live in the virtual world. Block suggests ways to overcome the distancing and isolating effects inherent in electronic connects. The book also includes practical guidance on how to ask better questions, gives suggestions for dealing with difficult clients, and contains expanded guidelines on more engaging forms of implementation. Peter Block is an American author, consultant, and publick speaker. His work encompass empowerment, stewardship, chosen accountability, and the reconciliation of communities. In 2004 he received an award from the Organization Development Network for his book Flawless Consulting, deemed most influencial book for Organizational Development practitionners over the past 40 years.